CRUD (Create, Read, Update and Delete) application is the most important application for creating any project. It provides an idea to develop a large project. 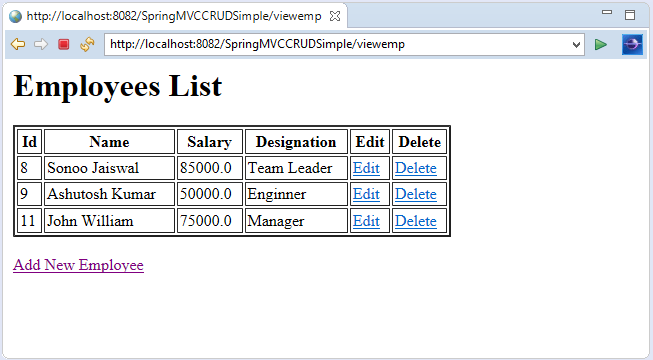 In spring MVC, we can develop a simple CRUD application. 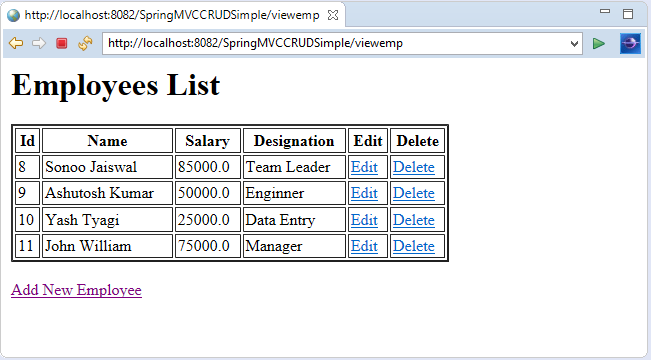 Here, we are using JdbcTemplate for database interaction. Here, we are using emp99 table present in the MySQL database. It has 4 fields: id, name, salary, and designation. Here, id is auto incremented which is generated by the sequence. 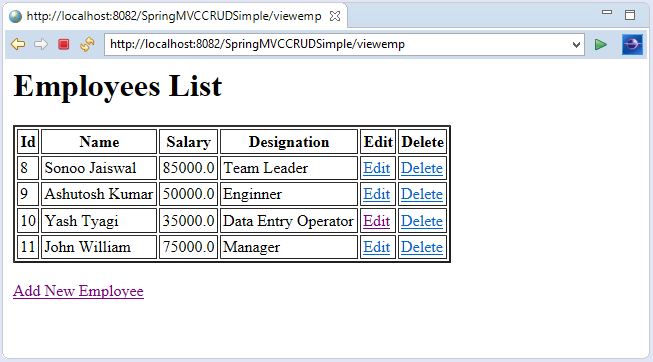 Here, the bean class contains the variables (along setter and getter methods) corresponding to the fields exist in the database. Let's create a DAO class to access the required data from the database. 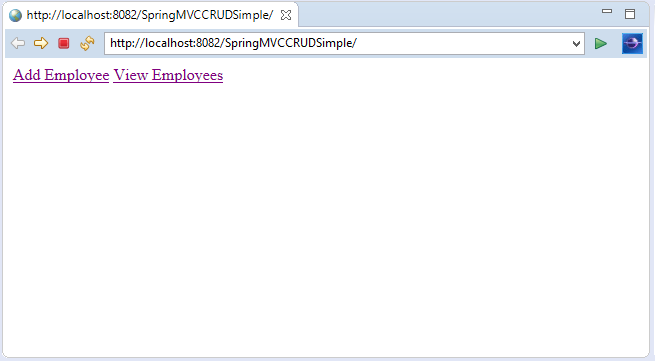 Here "/SpringMVCCRUDSimple" is the project name, change this if you have different project name. For live application, you can provide full URL. 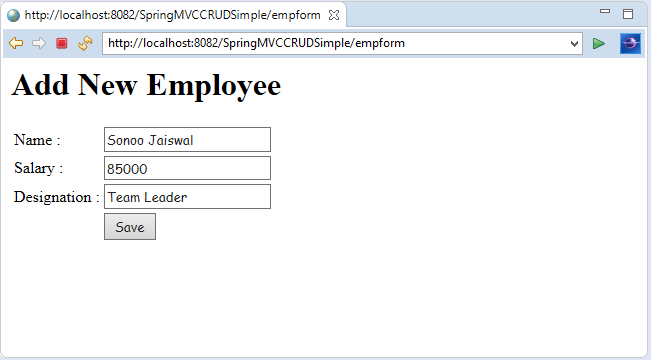 On clicking Add Employee, you will see the following form. Fill the form and click Save to add the entry into the database. Now, click Edit to make some changes in the provided data. 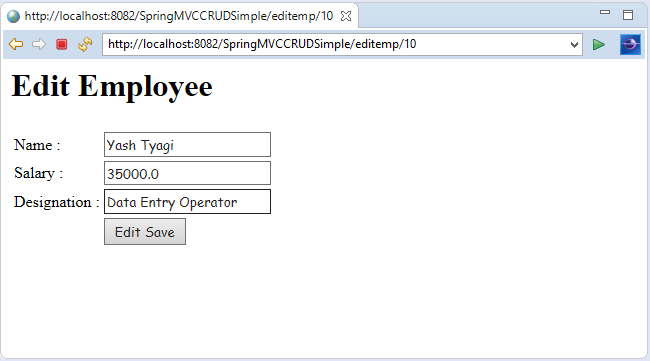 Now, click Edit Save to add the entry with changes into the database. Now, click Delete to delete the entry from the database. If you are not using maven, download MYSQL-connector.jar.